Chemical storage facilities located near population centers have long posed both a security and an emergency response challenge for government agencies. An accidental release of chemicals from a storage facility or a chemical transportation vehicle would require nearby municipal agencies to track the chemical's gas cloud or "plume" in order to determine its potential impact on nearby population centers. In light of the events of September 11, 2001, the possibility of an intentional release, with potentially high impact, must also be considered. The plume origin location can be interactively selected. This article discusses a pilot application developed jointly by Erie County and ESRI business partner URS Corporation's Buffalo, New York, office. 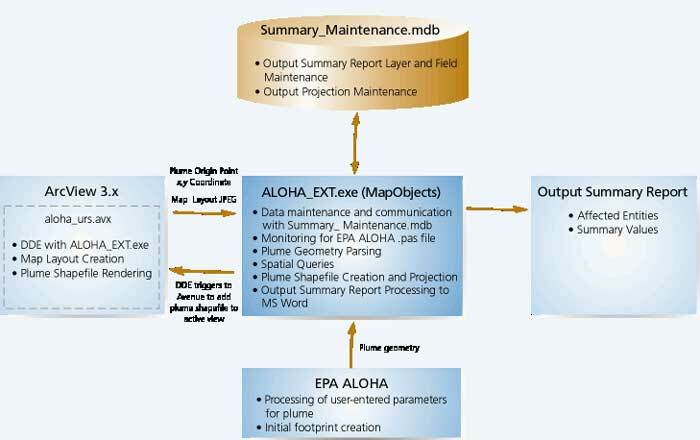 This pilot application integrates the Environmental Protection Agency (EPA) Aerial Locations of Hazardous Atmospheres (ALOHA) program with MapObjects and ArcView technologies to provide rapid, real-time modeling and reporting for chemical plumes and the areas that they affect. Erie County is located in western New York State. Its population is 950,265 (Census 2000) within a land area of 1,044 square miles. The county's largest city and county seat is Buffalo. ALOHA is a program developed by the EPA Chemical Emergency Preparedness and Prevention Office (CEPPO) and the National Oceanic and Atmospheric Administration (NOAA) Office of Response and Restoration and is part of the agency's Computer-Aided Management of Emergency Operations (CAMEO) suite. It is available without cost. ALOHA contains a database of approximately 1,000 common chemicals. Using information from this database, including chemical type, accident location (urban or rural), weather conditions (temperature, wind speed, and wind direction), and accident parameters (storage medium, size of opening, pressure of storage medium), ALOHA can predict the atmospheric dispersion rate and direction of vapors from a broken pipe, tank, or other source. ALOHA can also generate a visual representation of the plume created by the chemical release. ALOHA, designed as a lightweight emergency response tool and training aid, is relatively easy to use and integrates well with the CAMEO suite; the original CAMEO applications; and MARPLOT, a mapping application. ALOHA's limitations include reduced prediction capability at low wind speeds, with variable wind direction, or under highly unstable atmospheric conditions. ALOHA cannot incorporate chemical solutions, particulates, chemical reactions, or the results of fires into its modeling processes. Prior to requesting assistance of URS, the Erie County GIS Division had experimented with an ArcView extension that converted and imported ALOHA plume geometry into ArcView 3. Use of the ArcView extension, however, required the operator to have some basic GIS experience. Moreover, the shapefile created by the extension could be created only in a decimal degrees coordinate system. Finally, the extension offered no analytical capabilities for determining which entities would be affected by the plume. Required minimal to no GIS experience to use. It would thus be possible for emergency response personnel, not just county GIS staff, to run the application. Could automatically overlay and project the shapefile created from plume geometry developed by ALOHA into an ArcView view that would allow the operator to focus on the task at hand. Could run an analysis of county-defined geographic entities that might be affected by the plume. Would quickly create a report on the affected entities, covering county-defined attributes (such as population) to help quantify the effects. This report would contain an executive summary of potential plume effects for submittal to decision makers and a more detailed report. Utilized an autosave feature that would catalog and save each plume generation instance and allow the user to easily regenerate plume shapefiles and output summary reports and adjust emergency response planning and resources in response to changing atmospheric conditions. The solution developed by Erie County and URS Corporation made use of several technologies that provided for future application enhancements and portability. Although planning to migrate to the ArcGIS platform by the end of the year, the county needed the application to work with its existing ArcView 3 technology. The core engine of the program developed for use with ArcView 3 is a MapObjects-based executable. MapObjects was chosen for its stand-alone capability and its better portability to the COM-based ArcGIS architecture. Minimal source code authoring was invested in Avenue. A key benefit of the application is that it allows county GIS administrators to configure the application to present features from spatial data sources that emergency response decision makers would want to see in the event of an emergency. Examples of these data sources include schools, medical facilities, shelters, police and fire stations, and senior housing. The Output Summary Report (OSR) created by the application was developed to provide maximum flexibility in reporting. An administrator of the application can determine which shapefiles will be overlaid against the plume shapefile. In turn, specific attribute fields in a selected shapefile can be selected for inclusion in the OSR. If an attribute field contains numeric values, these can be summarized in the Executive Summary report. The order in which shapefiles are presented in the report can also be set in addition to the order of display for selected attribute fields from a shapefile. County GIS administrators can also set the projection into which the plume will be projected after it has been imported into ArcView. For Erie County, this would typically be New York State Plane West North American Datum of 1983 (NAD 83), but options are also available for New York State Plane West NAD 27 and Universal Transverse Mercator (UTM) coordinate systems. Ease of application use was a primary goal of the development strategy. The application can be launched from the View menu of ArcView. Erie County GIS staff have a preset ArcView project (.apr file) that emergency responders use when running the application. This .apr file contains all data sources that are defined and configured in the Summary Report database. Users of the program can pick the plume's origin interactively by clicking the source location in ArcView. Alternately, the user can pick a location based upon a user-entered address. Once the plume origin point has been determined, the user can launch ALOHA from the program and define the plume's location and chemical and atmospheric parameters. Another key benefit of the county's application is its ability to determine when a plume is ready for import into ArcView. The application monitors ALOHA's installation directory constantly until the .pas file (a text file containing the raw plume geometry data) is present. This file is then processed by the county's application. Once the required information has been collected and the data entered, the processing of the plume begins. Two polygons, representative of the plume's outline, as defined by user-specified Level-of-Concern (LOC) values, are created by ALOHA. The first polygon, also called the plume footprint, represents an area where, with 100 percent probability, user-specified LOC values will be exceeded. It is presented as a shaded area enclosed by a solid line. The second polygon, outlined with a broken line, encloses the footprint closely at its upwind end but more broadly downwind. zone, and a footprint map. It represents an area where, with 95 percent probability, LOC values will be exceeded. The broken "uncertainty lines" that demarcate the larger zone represent potential changes in wind direction that might affect the direction, size, or shape of the plume. The application processes each of these shapes into a single shapefile with attribute values for each of the two polygons being automatically generated. Once the shapefile is created, it is projected into the coordinate system defined by the user. The projected shapefile is then added to the current view in ArcView. A unique classification scheme based on either of the two confidence category values is applied from a legend (.avl) file. Processing takes 20 to 30 seconds. If the user wishes to create summary reports, a spatial overlay query is run in which the plume created by the application is overlaid against all the shapefile sources defined in the OSR configuration. Attribute values of entities that are found within the plume are then reported to the user. The resultant report file is saved as a Microsoft Word file. The report also includes information about the footprint such as time, location, chemical type, model run, user-specified LOC, maximum threat zone, and a footprint map. The program, which can produce numerous plumes and OSRs in real time, does not require restarting to create a new plume. For example, if an atmospheric parameter such as wind speed changes, the user can regenerate the footprint in ALOHA, and the county's ALOHA extension can easily regenerate a plume and OSR from the new parameters. Future versions of the application may go in any of several directions. Two possible directions are Web integration with ArcIMS and the addition of routing capability. Web integration with ArcIMSThe application could be enhanced to place a copy of an output plume in a directory that could be read by an ArcIMS service. This would provide critical information more efficiently to a wider audience for emergency notification applications. Concurrent with the creation of the plume shapefile, the output summary report could be created in an HTML/Web-readable format for ease of use on an Internet/Intranet platform. Routing capabilityIf integrated with network routing software, the application could be developed to provide emergency responders with routing information to handle numerous scenarios such as avoiding a contaminated area, deciding which streets to close, and designating alternate routes for evacuation to shelters. GIS has become an essential tool in emergency response planning and in enabling decision makers to manage a crisis situation effectively. Having accurate information on areas impacted or potentially impacted by a disaster, such as the release of a hazardous gas, helps ensure the proper utilization of critical resources. By integrating applications designed for specific disaster scenarios with customizable GIS technology and real-time data, planners can be much better prepared for these scenarios than they have been in the past. The author thanks Dale Morris, director of the Erie County Department of Environment and Planning, Office of Geographic Information Services for helping make this project possible. He thanks Leigh Whyte, Kevin Siepel, and Lana Khitrik of URS for their assistance in preparing this project summary. Brian Tomaszewski is a senior GIS analyst/programmer with URS Corporation's Buffalo, New York, office. He served as lead programmer and designer of the described application and is pursuing a master's degree in geography/GIS at the State University of New York at Buffalo. He may be reached at Brian_Tomaszewski@urscorp.com. What is the purpose of Plume Modeling? What type of Decision Support System was developed? Who is the intended user of the DSS? Tomaszewski, B., "Erie County Emergency Response and Planning Application Performs Plume Modeling", March 6, 2005 at URL DSSResources.COM. Brian Tomaszewski, URS Corporation, provided permission to use this case study and screen shots at DSSResources.COM on February 17, 2005. This case study was posted at DSSResources.COM on Sunday, March 6, 2005. This case also appeared in ArcUser Online, October-December 2003, URL http://www.esri.com/news/arcuser/1003/plume1of2.html .